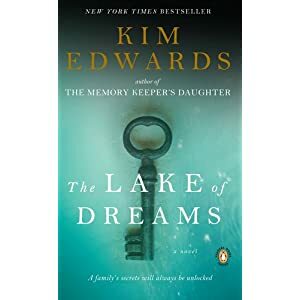 That’s pretty much how I felt about Kim Edward’s (the author of The Memory Keeper’s Daughter) latest, The Lake of Dreams. I had very good intentions concerning this book. I was going to read it quickly, write an amazing review, promote it like crazy, et cetera, et cetera. And it just didn’t happen. I don’t know whether or not it had anything to do with my terrible mood these days, or all the drama at work, or the craziness of the holiday season, or if it was because I just really couldn’t get into the book. I loved the premise of this book; a woman who had been living abroad heads back to her small home town to visit her family and discovers a dark family secret. Sounds intriguing right? That’s what I thought. But I just couldn’t get into it. I picked up and put down this book dozens of times. The style of the book is beautiful and the writing is stunning. I never felt like I wasn’t in the town, seeing all the things our heroine, Lucy, was seeing. I think Lucy was the problem for me. I never understood her motivation. Why was she so fascinated by the papers she found in attic? What was pulling her to discover more about the people and eventually open up a can a family worms? I didn’t identify with her at all, and for me, identifying with the main character is a must. And ultimately, that was what made this book a did not finish (aka DNF) for me. I just didn’t understand Lucy enough to want to continue her story. It was a struggle to make it even halfway through this novel. I didn’t feel pulled into the story enough and wasn’t attached to Lucy’s character enough to finish it. HOWEVER. You may really like this novel. You may adore Lucy. So don’t let this review influence you one way or another. Like I mentioned before, I’ve got a lot going on in my life right now. Perhaps this wasn’t the time for a heroine with a lot going on too. If you read the book, I want to hear about it! Do you agree with me or did you love it? Let me know in the comments! This is a sponsored post by BlogHer’s Book Club. I received a free copy of the book and compensation, but all opinions are mine and mine alone.